Global security and aerospace company Lockheed Martin is testing nanofilters using its patented Perforene (graphene sheets with precisely sized holes as small as 1 nanometer meant for water desalination) for oil and gas industry wastewater management. The company states that the ultimate goal is water desalination, but more feasible and immediate uses can be found in the oil and gas industry, where the requirements in terms of the quality of the graphene and hole sizes are less challenging. Lockheed Martin is working with two firms in the oil and gas industry to assess the feasibility of using Perforene filters to clean drilling wastewater. The aim is not the total elimination of contaminants but targeting the worst of them, making the problem more manageable. 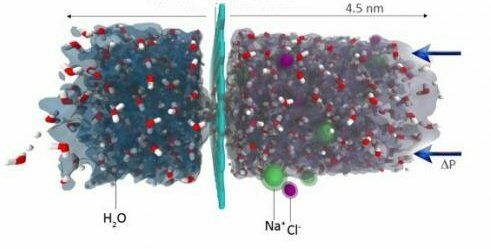 This goal only requires 50-100 nanometer sized holes, compared to 1 nanometer holes required for desalination. The company claims that commercialization of Perforene filters could begin in the next five years, possibly with some sort of medical device that would only require small amounts. Finding a way to produce graphene with single nanometer-sized holes on a commercial scale for desalination would probably take five or more years. The company has tested it only on a small scale, but the results were promising. In 2013, Lockheed Martin developed a water desalination technology with nanometer-sized holes, with hopes of commercialization around 2014-2015.